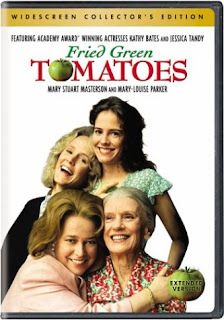 I must have watched the movie Fried Green Tomatoes at least ten times when I was younger, and many more times since. The film intersects the mid life crisis of a housewife, played by Kathy Bates, and an old woman who recounts the friendships and heartaches she faced in earlier years. I have so many favorite scenes from the film, including Kathy Bates slamming her car into another to make her own parking spot and later wrapping herself in saran wrap in an attempt to spice up her marriage. My fondest memories from the movie come from Idgie (played by Mary Stuart Masterson) and Ruth (played by Marie-Louise Parker) who start out at odds then become dearest friends. Idgie and Ruth come to own the Whistle Stop Cafe, where they make fried green tomatoes, delicious pies, and barbecue meat that may or may not include the remains of Ruth's ex. It wasn't long after seeing the movie that I attempted to make fried green tomatoes for myself. Growing up in Oklahoma, you assume anything will taste better fried, which is often the case. In this particular case, it turned out to be quite true. I tweaked the recipe the last time I made fried green tomatoes, including panko crumbs to make them extra crispy. It turned out to be the perfect addition. 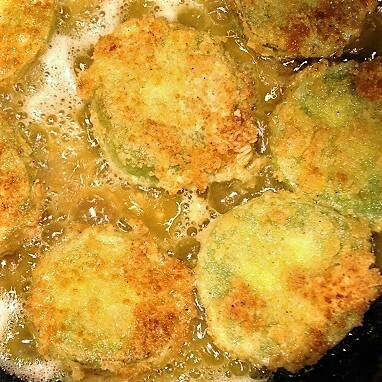 If you aren't from the south, you may think fried green tomatoes sound bizarre, but if you like fried veggies, like fried zucchini, you'll love fried green tomatoes. They taste similar to mild-flavored fried veggies, like summer squash, with the addition of a slight tangy flavor. 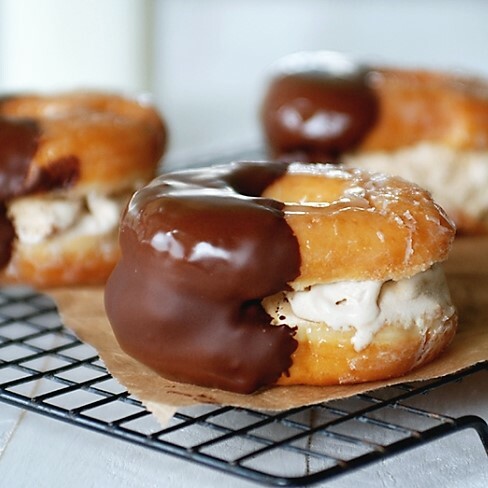 It's so delicious, and perfect for summer! The trick is in the breading and the method. If you aren't familiar with deep frying food, keep these tips in mind - wait until the oil is hot (sprinkle a bit of the batter in the pan, and if it sizzles, the oil is hot enough), pat the tomatoes dry before coating with the batter, don't crowd the pan, and once you get to the 2nd and third batches remember that the tomatoes will fry faster than the first batch. 1. Slice tomatoes into 1/2 inch thick slices and pat dry. Combine the flour, crumbs, and seasoning in the same bowl, then beat the eggs together with the buttermilk in a separate bowl. 2. Heat the oil over medium heat in a nonstick skillet. Dip each slice into the egg mixture then into the flour mixture and fry about 5 minutes on each side or until golden brown and crispy. 3. Lay out in a single layer on a cooling rack and sprinkle with salt (optional). Let cool for a few minutes and enjoy! I know they're out there, but I've never seen green tomatoes.